High blood pressure (hypertension) is an important risk factor for the development and worsening of many complications of diabetes, including diabetic eye disease and kidney disease. Most people with diabetes develop high blood pressure during their life. Having diabetes it self increases your risk of developing high blood pressure and other cardiovascular problems, because diabetes adversely affects the arteries, predisposing them to atherosclerosis (narrowing of the arteries). Atherosclerosis can cause high blood pressure, which if not treated, can lead to blood vessel damage, stroke, heart failure, heart attack, or kidney failure. High Blood pressure along High Blood Glucose and Lipid levels predispose Diabetics to serious complications like Heart Attack, Stroke and Kidney Failure. Thus proper control of Blood Sugar, Weight, Blood Pressure and Lipids is very important in preventing these deadly complications of Diabetes. Normal blood pressure is 120/80 mm Hg (the first or top number is the "systolic blood pressure" and the second or bottom number is the "diastolic blood pressure"). Blood pressure 140/90 or more is "Hypertension". Even blood pressure which is in the higher range of normal (also called "Prehypertension") i.e. 120-139/ 80-89 affects your health. Studies have shown that people with prehypertension (over a period of 10years) have a two to threefold risk of developing heart disease. What should Blood Pressure Be if You have Diabetes ? If you are a diabetic, your blood pressure should be 130/80 or less. Having a normal blood pressure is as important as having good control of your blood sugar levels when it comes to preventing diabetes complications. What are the Stages of Hypertension ? 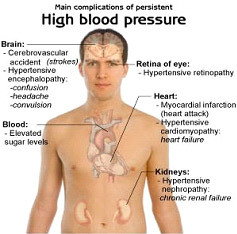 Usually, high blood pressure has no symptoms. Sometimes people with high blood pressure may develop: headache, dizziness, blurred vision, nausea, vomiting, chest pain and shortness of breath. ACE (angiotensin converting enzyme) inhibitors and ARBs (angiotensin II receptor blockers) are groups of medications that are often used to treat high blood pressure in people with diabetes. Although other medicines are also available, but ACE and ARBs have been shown to treat not only high blood pressure, but have been shown to prevent or delay the progression of kidney and heart disease in people with diabetes. Some blood pressure medicines may adversely affect your blood sugar and lipid levels. Blood pressure medicines can also cause impotence. Talk with your doctor about the side effects of prescribed medicines. Other drugs used to treat high blood pressure in people with diabetes include- diuretics, calcium channel blockers, beta blockers and alpha blockers. Because adequate control of blood pressure usually requires more than one medication, most doctors use ACE or ARBs first, and then other anti-hypertension drugs are added one by one. Always consult your doctor before changing any medicine. What is "Resistant Hypertension" ? 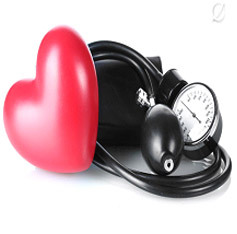 High Blood Pressure is often difficult to treat in most of the diabetics and may require three or more medicines. If Blood Pressure in not controlled by three agents in their maximum doses (one of the agent has to be a diuretic), it is called as "Resistant Hypertension". To help prevent high blood pressure: Limit salt Intake, Eat Healthy Diet, Take Regular Exercise, Maintain a normal body weight, Control your Blood Glucose, Stop smoking, Limit alcohol consumption, and Visit your doctor regularly.